Among the organic programs that weren’t included in the extension of the 2008 farm bill are those that fund organic research and extension, cost share to become certified as organic, and an organic data collection system — the same sort of data collection system that has long been a mainstay for conventional agriculture and that qualified to receive continued funding. Cuts to these programs will have a significant impact on organic farmers, especially those that are small and mid-sized operations. The cost share program, funded at $22 million in the 2008 bill, was intended to help these farmers cover their certification costs by providing a reimbursement on application fees, inspection fees, travel, and postage. The cuts to research will also be significant, as the Cooperative Extensions which operate out of universities in each state, were working to provide “research-based information” to producers, including organic farmers. Already, research for organic agriculture does not get enough funding to keep up with the growing industry. These cuts will only make this more severe. Supporting organic agriculture is important in order to diversify our farming industry and expand access to healthy foods. These programs were established because our lawmakers recognized their important public benefits. Not being included in the farm bill extension is 9 months of continued uncertainty for these farmers. Let’s hope that Congress recognizes their importance in September when it takes up the farm bill debate again. The Senate version of the bill would include $23 billion in cuts to nutrition assistance and farm subsidies over 10 years. The House version– which was never brought to a floor vote– would include $35 billion. While agriculture groups are anxious for a farm bill to be passed, the cuts to SNAP would be devastating to the nearly 50 million people who rely on them, especially in these challenging economic times. We’ve shown before how safety net programs are key to keeping many families out of poverty. A related news story reports that without a new farm bill, the price of milk could go up to $8 per gallon. The law will revert to the 1940s regulations, which include an out-dated formula for determining the cost of milk. This would not only be a blow for consumers, but for dairy farmers as well. Even if the cost does not increase all the way up to $8, it is likely that prices will increase both because of a lapse in the farm bill but also because of the severe drought that affected midwestern farmers. The issues before Congress right now are pressing and critical to our economy, our agriculture industry, and our families. Hopefully an effort to expedite the passage of a new farm bill won’t compromise the needs of working families across America. As always, the issues are interrelated. A long-term solution would incorporate the needs and perspectives of both. Amid the debates about the “fiscal cliff”– the spending cuts and tax increases to take effect on January 1, which could plunge the economy back into recession– farmers and advocates from across the country have also been pushing for the passage of a new farm bill. The 2008 farm bill expired at the end of September and compromise between the House and Senate toward a new farm bill was stalled as Congress went into recess. Now that Congress is back for the “lame duck” session, the House and Senate have just weeks to reach a decision on the farm bill and take action to avert the fiscal cliff. The Washington Post reports that spending cuts in the farm bill may be a component of an agreement on the fiscal cliff, and could expedite the passage of a new bill. At hand is the significant cut to the Supplemental Nutrition Assistance Program (SNAP, or food stamps) in the House version of the farm bill. While the Senate version cut the program by $4 billion, the house quadrupled that for a $16 billion cut. Given that legislators are looking for ways to cut spending ahead of the looming January 1 deadline, these cuts could become part of a compromise. Farm advocates like the American Farm Bureau Federation are pushing for the new farm bill to be passed as a part of a package along with the fiscal measures. While this may be expedient for farmers and agriculture, the 47 million Americans who receive food stamp benefits are hanging in the balance. As both the unemployment and the poverty rates remain high, SNAP provides necessary aid to struggling families. We have blogged before about how SNAP and other safety net programs help keep many families out of poverty– without them, the poverty rate would be much higher. A new farm bill is needed to provide policy and regulatory guidance for a strong, healthy and sustainable agricultural industry in the U.S. This bill should also the preservation of SNAP and the essential service it provides to millions of families across the nation. It’s important that in any compromise, the viability and importance of agriculture policy and safety net programs like SNAP are preserved. Both are needed to address hunger, food access, and poverty. Today is election day. In a week, Congress will be returning to Washington for the ‘lame duck’ session. It’s uncertain whether or not the political gridlock that has characterized this Congress will continue, or if it will ease up and allow for some important business to get done. Either way, there are some significant issues that will be taken up. The biggest priority for Congress will be passing a budget to avoid the looming ‘fiscal cliff,’ but there are other issues that need to be resolved as well– namely, the Farm Bill. However yesterday, Barry Flinchbaugh, a Kansas State University agricultural economist and top farm policy expert told attendants at an agricultural bankers meeting that he predicts the Farm Bill will not be enacted until April of 2013. As we have explained before, the lapse in passing a new bill will not have impacts until the start of the new year. The Supplemental Nutrition Assistance Program, SNAP, will continue through March, as it was extended under the six-month spending bill passed by Congress before the recess. Waiting until April would trigger some of these impacts, which include a lapse in conservation programs and spikes in milk prices. Some have argued that this pause can allow for reforms of the farm bill provisions, while farmers and others in the agriculture sector are impatient for the next Farm Bill, as the uncertainty of not having a long-term policy makes planning for the upcoming year difficult. Since October 1, farm policy has been reverted back to the 1938 Agricultural Adjustment Act. If Congress can’t manage to pass a new Farm Bill by the end of the year, Reuters reports that a short-term extension of the 2008 bill could be a likely outcome. But Flinchbaugh points out that ultimately, Congress can elect not to pass a one-year extension, which has happened in previous years. Neither scenario is good for farmers, consumers, or low-income families. Reform might be possible if our elected officials could work together toward some semblance of a compromise. So far, the current Congress’ track record makes it hard to have faith in any bipartisan cooperation– but perhaps there is still some hope. Reform or not, something must be done about farm policy to avoid the consequences of having to abide by outdated policies. Kicking the can down the road won’t fix the problem, it will just drudge up the same argument one year from now. Hopefully, our Senators and Representatives will return to D.C. next week with an intention to get to work and pass both a resolution to the impending fiscal cliff and a new Farm Bill. R&D focuses on crops, but what about communities? The chart shows the descending amounts spent by public and private dollars on various topics. Most of the research is conducted on food manufacturing and crops. Less on animals, farm machinery and the environment. Even less on nutrition, food safety and statistics. And then, over on the far right hand of the scale, we can see that a bare amount was spent on “social and community development.” Literally, we spend billions of dollars trying to understand how crops and animals live, but only a smidgeon on how humans and their communities can grow and develop. If we look just at the public sector investments, the green bars, it’s true– resources are heavily weighted toward crops and animals, and much less on the things that would help us understand how to make rural communities strong and resilient. 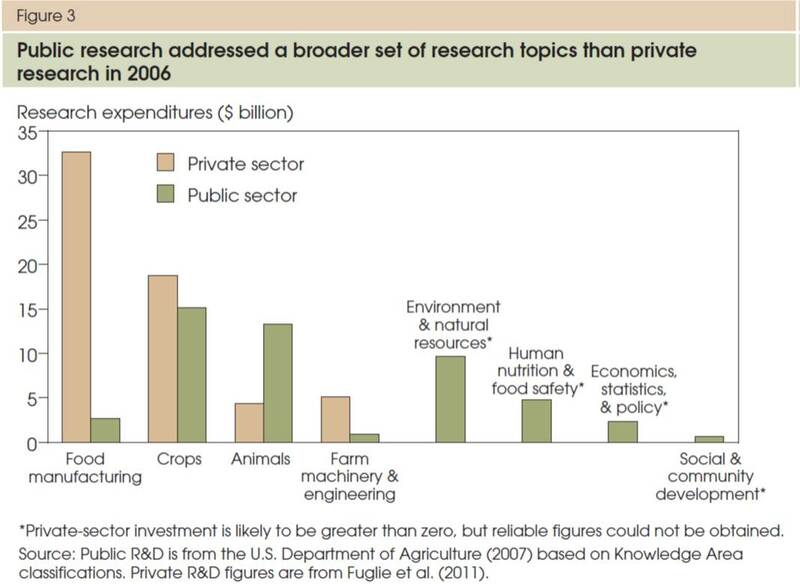 Daily Yonder also points out that even crop research is mostly spent on just three commodities (corn, soybeans, and cotton). Also, while biotechnology has boosted this research in the past few decades, there has not been a corresponding boost in research on communities and local economies. This is a far cry from what our rural communities need right now. And that may be one reason why we know a heck of a lot about how to grow corn in a drought but not so much about how to develop rural communities that thrive.o wonder we have bountiful harvests and troubled towns. Once the 2008 farm bill expires, it would revert back to the permanent provisions set in the Agriculture Adjustment Act of 1938 and the Agriculture Act of 1949. The farm bills that have been passed since are five-year measures that suspend these former acts. But without a new five-year bill, what would a reversion to the 1940s look like? These laws were passed in a very different era, and as the Omaha World-Herald puts it, “Imagine farmers dumping tons of corn and wheat on the federal government at wildly inflated prices.” Some commodities farmers would benefit significantly because of the way price supports were set up back then; but others, whose crops were added on in later bills, would get nothing. However, as NPR reports, these changes wouldn’t take effect until January 1. The 2008 farm bill covers crops through 2012. Once the new year begins, these administrative and policy questions will kick in, and could cause much chaos. The Supplemental Nutrition Assistance Program (SNAP, or food stamps) will continue through March, as it was included in the six-month spending bill passed by Congress. Will Congress act in the nick of time? Probably, and it will be during the lame duck session– and that’s what certain legislators were hoping for all along. This is certainly not the first time the farm bill has lapsed. In 2007, the farm bill also lapsed and Congress didn’t pass the first extension until December 26th. $62,770 to WakeMed, Raleigh, NC, to improve food access in Wake County by: 1) purchasing EBT equipment, 2) providing training to farmers, and 4) hiring EBT management staff at two farmers markets that serve low‐income residents of Wake County. $44,768 to Foothills Farmers Market Inc., Shelby, NC, to expand production, storage, and distribution of perishable food in a food desert by equipping a market facility with refrigeration and starting a multi‐farm Community Supported Agriculture (CSA) operation. $57,750 to Town of Huntersville, NC, to enhance the Huntersville Farmers Market with new infrastructure and signage at the market, to promote the market with an advertising campaign, and to educate consumers about healthy meals with local produce. These programs will certainly help expand access to healthy foods, particularly with the emphasis on EBT usage, food deserts, and education. 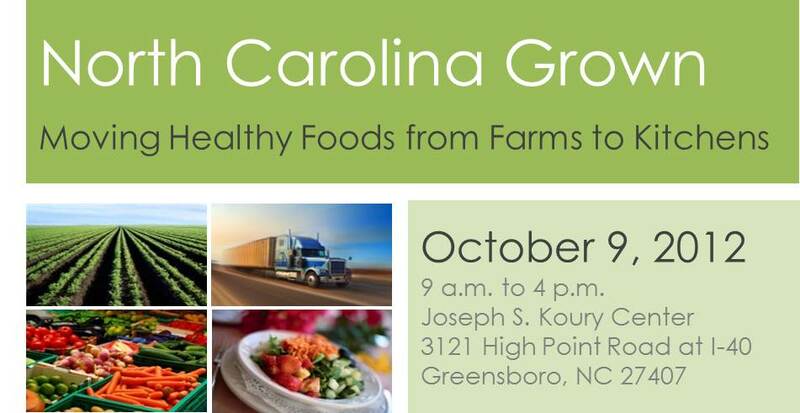 Further discussion of healthy foods access will be happening at the healthy foods forum, NC Grown, on October 9 in Greensboro. Information and registration can be found at http://www.thesupportcenter-nc.org/NCGrown.